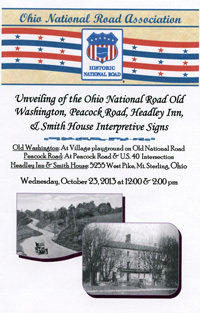 Ohio National Road Interpretive signs commemorating the Smith House & Barn and the Headley Inn were unveiled on Wednesday, October 23, 2013. 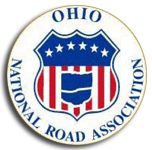 The sites are next door to each other and are located on the National Road/US 40 in Muskingum County about five miles west of Zanesville. 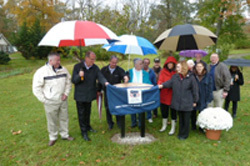 Shown unveiling the Headley Inn sign are( L to R): Todd Sands, Jerry Lavy, Jim Porter (Muskingum County Commissioners), Judith Lowther (Proprietor, Smith House), Lowell Meredith (Employee, Timber Run Nursery), Mike Peppe, Cathy Nelson, Mary Ellen Weingartner (ONRA Board members), Linda Wagstaff (Ed’s wife), Al Chaffee (Proprietor, Headley Inn), Elizabeth Reeb, Ed Wagstaff (ONRA Board members), and Pat Chaffee (Proprietor, Headley Inn). 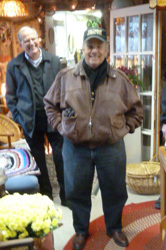 Also present was ONRA President Doug Smith who officiated and took the photos. ONRA Muskingum County Board representatives Mary Ellen Weingartner (at right) and Elizabeth Reeb performed a short skit which the attendees found to be most entertaining! 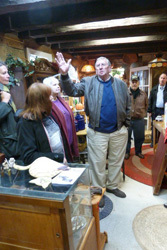 ONRA Guernsey County Board representative Ed Wagstaff (center) spoke about the history of the National Road in this area. Also shown (L to R) are: Rebecca Wagstaff, Pat Chaffee (back to camera), Linda Wagstaff, ONRA Signage Committee Chair Mike Peppe, and Muskingum County Commissioner Jim Porter. 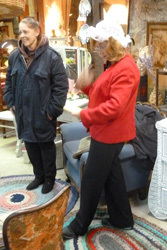 Judith Lowther (at left – owner of the Smith House) and Rebecca Wagstaff look on during the entertainment. 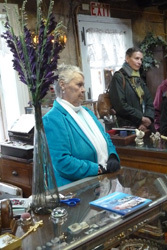 Ms. Lowther operates a Bed & Breakfast and an Antique Shop in the historic Smith House. Muskingum County Commissioner Jerry Lavy and ONRA Franklin County Board representative Mike Peppe were on hand for the unveilings and enjoyed the entertainment, too! 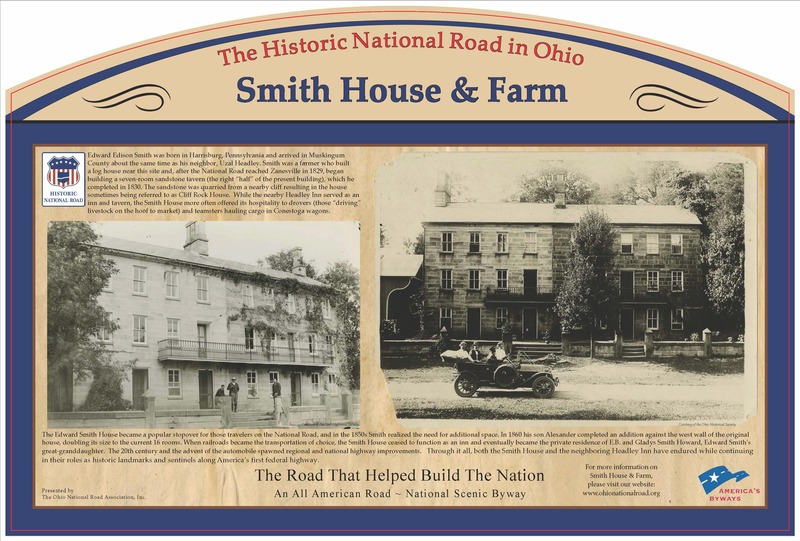 The Headley Inn and Smith House & Barn interpretive signs are located at 5255 West Pike (National Road/US 40) Zanesville, OH. 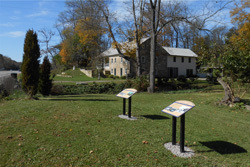 These signs, commemorating the Headley Inn and the Smith House & Barn, are installed between the two sites. 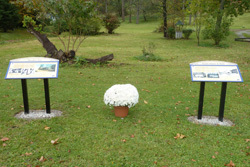 This picture shows the signs with the beautiful and historic Headley Inn in the background.